The continued importance of video messaging and visual content is emphasized by the changes that are occurring across almost every major social network, including Facebook, Instagram, and Twitter. At the same time, videos have become powerful branding tools for companies looking to communicate more easily with their customers, and video messaging is finding its place as one of the major marketing tools in business today. That is because video messages, when done correctly, are more engaging, more memorable, drive more traffic, and hold almost every other advantage over text alone. Over the past few years, the pressure to use video as a part of a business’s marketing efforts has grown exponentially. Do you have an effective video messaging strategy in place to capture the attention of your target audience? Below are 11 tips that can help you understand the power of video messaging, what to look for when you are choosing your video messaging platform, and how to make it work for you. Video messages engage customers five times more than emails or text messages – Not only do videos grab people’s attention, they tend to keep it longer. Video messaging is one of the most engaging mediums you can use. Video messages help build likability with your customers – One of the most frequently quoted statistics on nonverbal communication is that 93% of all daily communication is nonverbal. Body language and verbal tone play a massive role in conveying a message and a written or text message just can’t portray 100% of what you or your salespeople want to say. You can capture that with an effective Video Message strategy, and your customers will have no doubt seeing your true personality. People do business with who they like and when the easiest way for your customer to get to know you and your brand is through Video Messages. Video Messages show transparency about your sales process – Video tends to build trust more so with consumers than text alone. A personal video can garner the trust of consumers by presenting them with information they can easily remember and apply afterward. Video Messages build your sales person’s confidence – The easiest way to build your salespersons confidence is for him/her to close the sale and there is no better way to convert viewers into customers than with Video Messages. Simply put, videos drive sales! 74 percent of users who watched an explainer video to learn more about a product or service subsequently bought it and 77 percent of consumers say they’ve been convinced to buy a product or service by watching a video. You’re able to vary the way you follow up with customers – While a hand-written card sometimes can be a nice touch, variety can help create more top-of-mind awareness. If a photo is worth 1000 words, how many are a video worth? Video Messages differentiate you from your competition – Customers should come away from your Video Message experience not only knowing something about your products, but also with an idea of what you and your company’s culture is like, and this is what will really make you stand out. 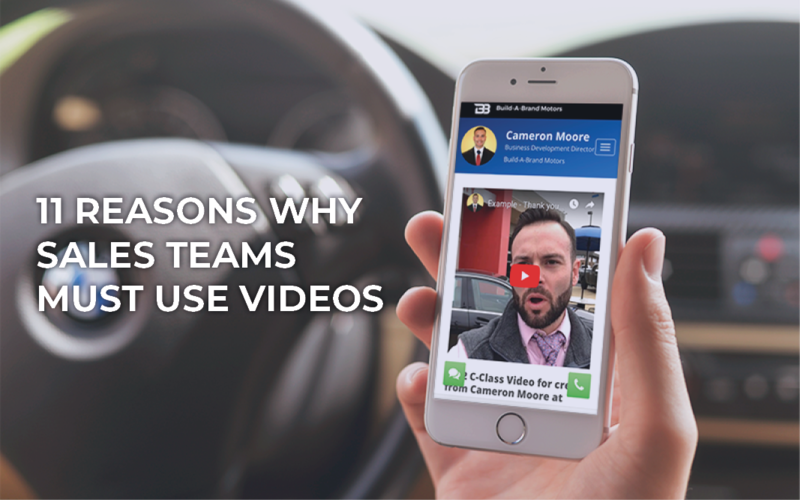 You can send Video Messages on multiple platforms – Whether you want to send through your CRM, personal email, or through an integrated system, a good video message platform should allow you to send video messages based on you or your company’s requirements. If done through SMS, it should be with software to ensure that you are protecting your company and is TCPA compliant. Video Messages are personalized and thoughtful, rather than cookie-cutter – Many companies and salespeople use the same email or letter for every one of their customers, only changing their name. With video, it is personal. It shows that you care and that you took the time to create something special and unique just for them. A one-minute Video Message is worth 1.8 million written words in SEO – Because there are fewer videos online than there are text articles, videos have a better chance of reaching audiences from keyword searches. Videos are 45 times more likely to rank on the first page of Google than text alone. Since Google owns YouTube, Google search results love videos. A video is 100 times more likely to be shared and viewed on social media than text alone – Internet users are naturally more inclined to share videos than text alone. Videos are quick, effective, relatable—all share-worthy components. It is a sign of our times that people love sharing content on social media and more importantly, they love sharing videos. They can evoke strong emotional responses that make people want to like, comment, and share. Videos get 1200% more shares than text and images combined and this number is only expected to increase. Video Messages show your personality – Your personality goes a long way in helping you stand out from your competition. Whether you are loud or thoughtful, or both, there is an audience out there just waiting and video is the tool for giving you and your company an identity and building relationships. If you’re looking for a solution that will allow you to gain visibility, cut through all the clutter, create connections with people and give your brand personality, Video Messaging is the smartest way to go. If you want to learn how to not only keep pace with the current video messaging trends but pull ahead of your competition in getting your message out to your customers, let Build-A-Brand help by clicking here!